Set on the 1849 Plaza de Arriba in Costilla, 30 miles north of Taos, this inn offers a Spanish Colonial stay in New Mexico’s wild north country. Each of the six suites boasts 24-inch- thick adobe walls, coved viga ceilings, and kiva fireplaces. Proprietor Bernie Torres, a fourth-generation resident, regales guests with stories of this land bordered by the 100,000-acre Valle Vidal, an expanse of forest and mountains enjoyed by guests who like to hike, fish, hunt, and sightsee. Torres tells stories of growing up here without electricity and telephones, of eating from the family garden and raising sheep. By special arrangement, he will cook a traditional meal such as calabacitas (squash with chile), roast lamb, and horno-baked bread, so visitors can sample a deeper taste of life here. Less than an hour’s drive from the inn, visitors partake of art and outdoor adventures in Taos, Red River, and Angel Fire. This hacienda in Española, 26 miles north of Santa Fe, offers a trip into old New Mexico. A Spanish fountain, lush gardens, and a collection of Navajo rugs and Pueblo pottery create a rich feel. The 10 spacious rooms exude Old World charm, with diamond-plastered walls, Spanish Colonial furniture, Mexican tile, and nichos (niches) holding retablos. The Manuel E. Garcia family, whose ancestors settled here in the 1600s, offer travel guidance to guests, mostly sightseers exploring the arts and history within a 45-minute drive of Santa Fe, Taos, Los Alamos, Abiquiú, and Chimayó. A cluster of five casitas set in a pine glade not far from Ruidoso, 184 miles southeast of Albuquerque, this retreat fulfills its promise of Western elegance. Owned by Stan and Amy Cape, the resort arose from their passion for design. Both Capes are architects who wanted to bring world-class accommodations to this mountain town known for its rustic cabins. The one- and two-bedroom casitas have an expansive feel, with high ceilings, marble countertops, and contemporary furnishings. Gas fireplaces fashioned from stacked sandstone, woodsy patios, and baths with Jacuzzi tubs add to the opulence. 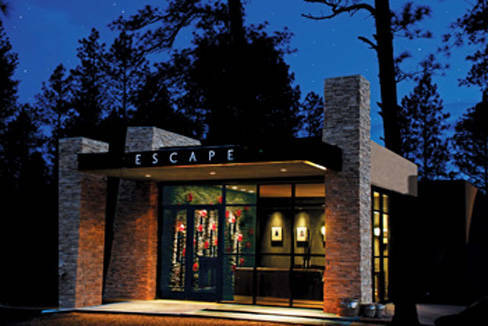 A perfect spot for travelers who enjoy luxury, the Escape provides access to galleries and cafés in Ruidoso, and to the natural wonders of White Sands National Monument and Carlsbad Caverns National Park. Set amid the stunning mountains of its namesake, this lodge in Kingston, 188 miles south of Albuquerque, offers a retreat to a rustic world. Run by Catherine Wanek, a pioneer of natural building and the author of the well-known book The New Strawbale Home, the inn serves as a base for nature lovers. The Lodge, built of brick in the late 1800s, is among a handful of surviving historic buildings in this old mining town, once one of the wildest in the region, with 3,000 people, 22 saloons, and a notorious red-light district, on Virtue Avenue. Today the Lodge feels like a big boarding house, with seven cozy rooms and comfortable common areas perfect for lounging and telling tales of adventures in the adjacent 3.3-million-acre Gila National Forest, and the galleries and cafes of Silver City, Hillsboro, and Truth or Consequences. This B&B near Cuba, 83 miles northwest of Albuquerque, is set on the working Rancho San Pablo de Garcias. The late 1800s Casa Vieja, the best part of the inn, with three guest rooms, offers wood floors, adobe walls, and early American antiques. Be sure to visit the poetic capilla, which features exposed vigas and a locally painted altar screen. Families in the Spanish Colonial era built such chapels to maintain their spiritual connections between visits to their remote ranches by itinerant priests. Hosts Vi and Ross Garcia tell visitors about Vi’s great-great -grandfather, Santos Cebada, who, in the mid-1800s, served under frontiersman Kit Carson and received this land as payment. Sightseers and nature lovers visit the nearby historic treasures of Chaco Culture National Historic Park, Abiquiú, Los Alamos, and Jemez Springs. Lesley S. King is a regular contributor to New Mexico Magazine. Learn more at www.lesleysking.com.